By comparison with the speaker coil, the solenoid is quite brutal, but it works by the same principle. 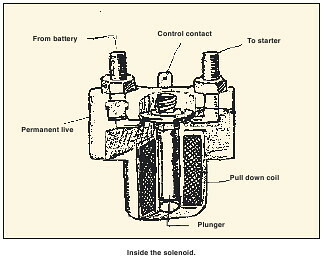 The simple solenoid consists of a spring-loaded plunger which, if depressed, would close the contacts of a high-power electrical switch. Typically this switch is in-line between the battery and starter motor. The solenoid plunger is suspended within an electromagnet and, when this is energised, it causes the plunger to be drawn inward. This, in turn, closes the switch contacts, allowing current to pass through. When the electromagnet is switched off, so too is the high-power circuit supplied from the solenoid. More sophisticated solenoids will feature a ‘pull-down coil’, and a ‘hold-down coil’. Most vehicles which feature this type of ‘remote-starter’ solenoid, allow the owner to spin-over or start the engine by simply depressing the plunger manually. This should not be the case with automatic vehicles. Solenoids are available to handle any power rating you might need on a car or truck. Later vehicles will feature a starter solenoid which is built into the motor assembly. This type of starter motor is known as pre-engaged, as well as its job as detailed above, the solenoid performs the function of positively placing the drive pinion in and out of mesh.